Swedish defence major Saab has responded to the Indian Navy’s request for information (RFI) for a maritime patrol aircraft (MPA) to meet the growing challenges in the country’s maritime realm. 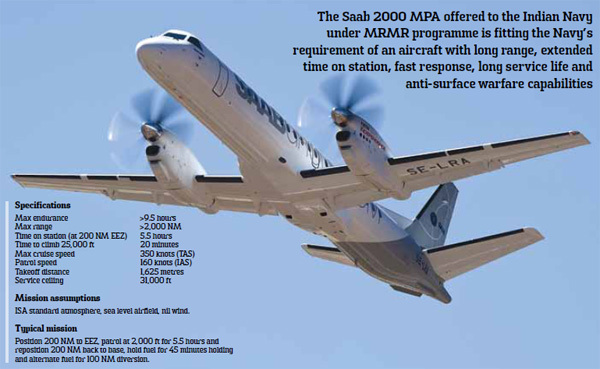 The company claims that the Saab 2000 MPA offered to the Indian Navy under the medium-range maritime reconnaissance (MRMR) programme is fitting the Navy’s requirement of an aircraft with long range, extended time on station, fast response, long service life and anti-surface warfare capabilities. And if Saab officials are to be believed, the aircraft on offer not only costs less than the other aircraft in the MRMR race, but also has a guaranteed life time of at least 25 years. The Saab 2000 meets all the requirements of the Indian Navy RFI, claimed Saab officials, which include maritime patrol, anti-surface warfare, search and rescue, electronic intelligence (ELINT), electronic support measures (ESM), electronic countermeasure (ECM), communication intelligence (COMINT), etc. The aircraft is capable of carrying two anti-ship missiles (ASM) and a jammer pod. Its electro-optical device is a third generation forward looking infrared (FLIR), CCD TV, laser range finder and recording facility. “The aircraft is meeting the RFI in every way and in fact can perform additional roles,” said Hultin, pointing out its anti-submarine warfare (ASW) capabilities not required in the RFI. Operating in various configurations with 35 different operators across the world, the Saab 2000 MPA as claimed by Saab is a high performer providing tremendous operational flexibilities for various operation scenarios. It has a cruise speed of 350 knots; can climb to an altitude of 20,000 ft in 10 minutes; reach an operating area of 1,000 nm within three hours. It can operate at a maximum range exceeding 2,000 ft, or longer patrol times at higher altitudes even up to 31,000 ft. It can operate at a maximum range exceeding 2000 nm, with mission endurance exceeding 9.5 hours from high altitude airfields, taking off with maximum load and fuel even at very hot temperatures. Further flight safety is maintained throughout all flight conditions, including single engine operations, where the aircraft can maintain an altitude at 20,000 ft. 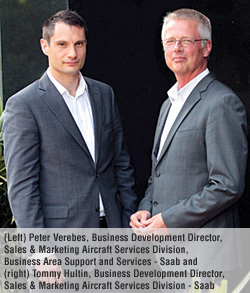 The company is offering the aircraft with a guaranteed support for 25 years and 35,000 flight hours. “Obsolescence can be managed in the next 25 years. 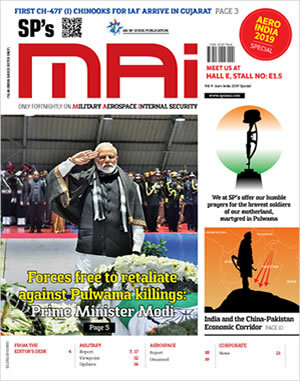 But the aircraft can go beyond 25 years with mid-life upgradation,” said Hultin and added, “We have worldwide support network including logistic support assistance and maintenance repair overhaul (MRO) hubs.” Though the Indian Navy’s RFI has no mention of the MRO requirement, Saab officials informed that the company is talking to partners in India to set up a MRO hub and added that the lifetime cost is a larger part of the actual acquisition cost. While the Saab 340 was designed in the 1980s, the Saab 2000 was designed in the 1990s. But the company officials do not find any issues even if their competitors come up with the latest model. “Guarantees and technical competence is much more important than having the latest model,” said Hultin. Speaking to SP’s M.A.I. during their recent visit to India, Saab officials Hultin and Peter Verebes, Business Development Director, Saab AB, said that India’s offset requirements and transfer of technology (ToT) is not a problem. “Saab has a long history of technology transfer,” they informed. Elaborating on the features of the aircraft on offer to the Indian Navy, they said that the Saab 200 MPA is equipped with Saab RBS15 ant-ship missile system and its command and control (C2) system facilitates a seamless planning of missile launching zones, trajectories and target seeking activities. The aircraft is also equipped with the state-of-the-art Selex fifth generation active electronically scanned array (AESA) and RBS-15 anti-ship missile. The AESA radar onboard is a modern high performance system that supports the full range of maritime surveillance and coherent imaging modes used for both naval and overland operations. The radar provides the aircraft identification friend and foe (IFF) capability with customised interrogator functions. It is supported by a Saab R4A AIS transponder receiver/transmitter system for locating and identifying and naval activity. The AIS system provides an encrypted data link. Likewise, for close range detection, identification and recording of surface objects and activities, the SAAB 2000 incorporates electrooptic (HDTV) and thermal imager sensors. It also has an ELINT system providing the capability to intercept and collect intelligence information consisting of detailed information of complex emitters active signal components, the relationship and the dynamics between active signal components. The aircraft on offer also has an ESM system for automatic identification of RF signal sources and direction finding of RF signal sources with high accuracy. For self-protection, a SPS system is installed including radar warning receivers, missile approach warning sensors, laser warning sensors as well as chaff and flare dispensers. The officials further elaborated that the aircraft is equipped with COMINT system that complements the baseline ELINT system for enhanced signals intelligence (SIGNIT) capabilities. The COMINT system in the aircraft includes both a direction finder function and intercept system. The Saab 2000 MPA is also equipped with a command and control (C2) system that integrates and assists in controlling all mission sensors and provides the user interface to mission operators, through four workstations installed side by side in the cabin facing starboard, and to the pilots through a dedicated tactical display. The workstation also provides access to the mission communication system. Additionally, no ground refuelling arrangement is necessary for the Saab 2000. “A bucket can be used for the refuelling purpose and thus there is no requirement for ground stations, support staff, technicians, etc. If required a pilot can easily do the job,” informed Hultin. Saab 2000 MPA was on display at Aero India 2011 in Bengaluru, and according to the company had a good number of visitors who had words of appreciation for the aircraft. “Many Indian Navy officials saw the aircraft at Aero India and liked it,” said Hultin.